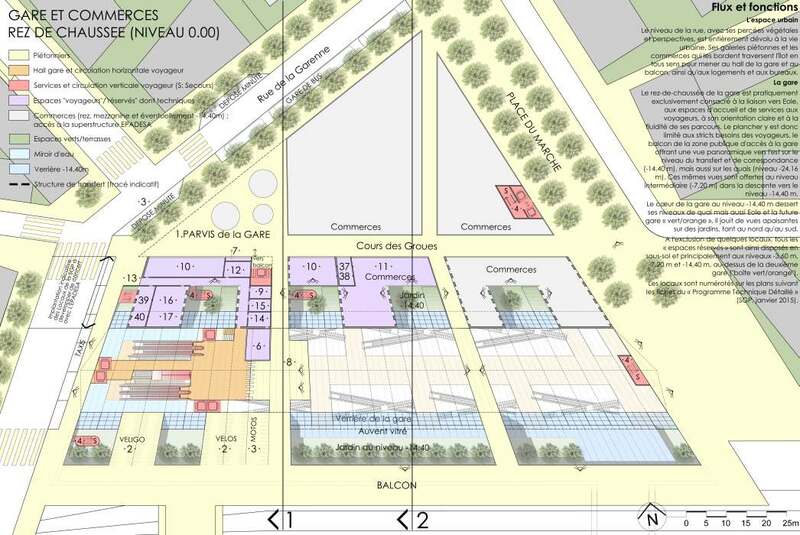 The Société du Grand Paris is looking to develop the concept of a functional station, with the aim being to create an emblematic station: this shift in definition is consistent with the recognition of the role of Nanterre La Folie station in its urban setting, namely its visual prominence in the local area and its ability to act as an active, central focus which is undoubtedly generated by the flows of people using the rail network. 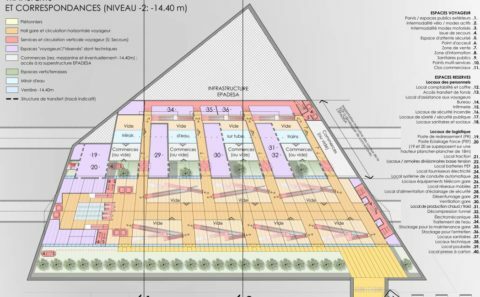 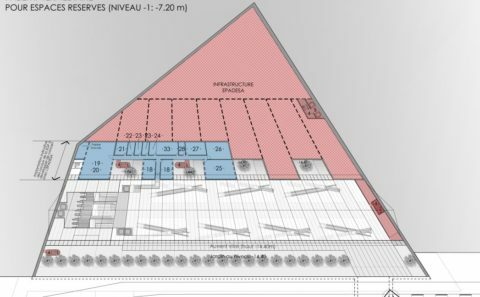 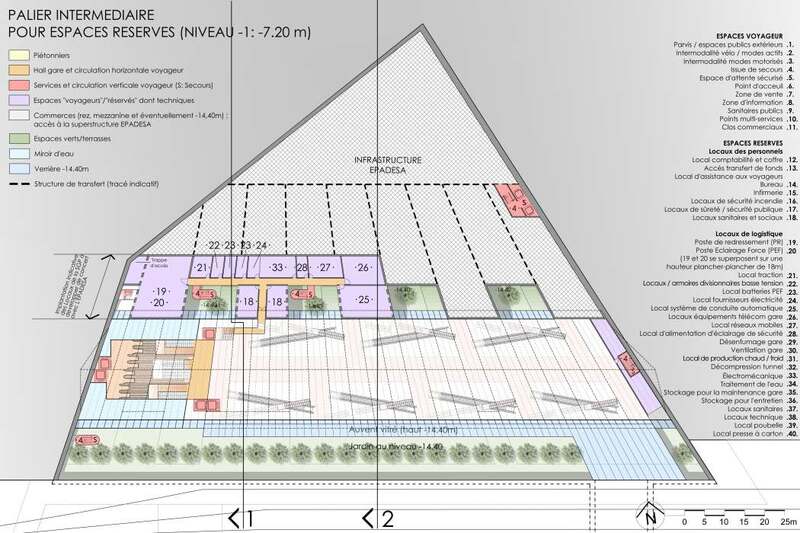 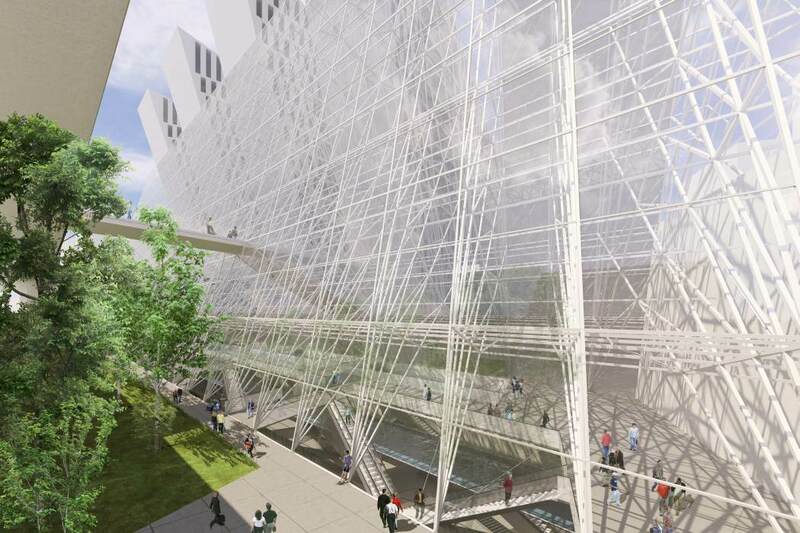 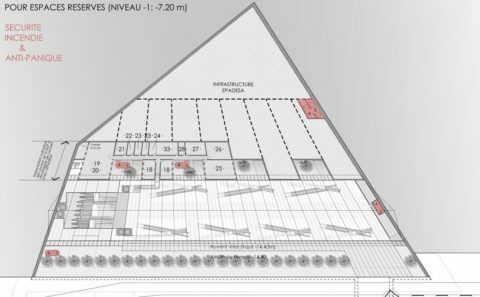 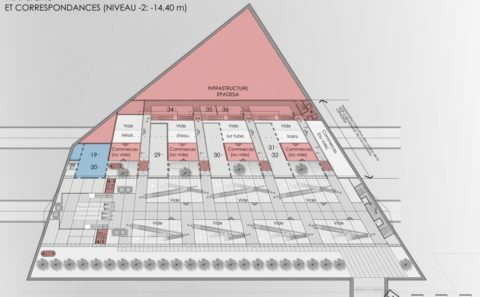 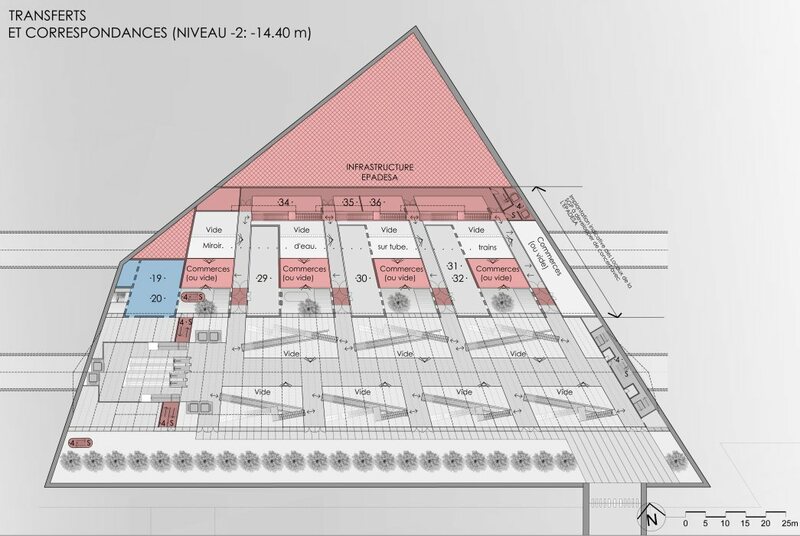 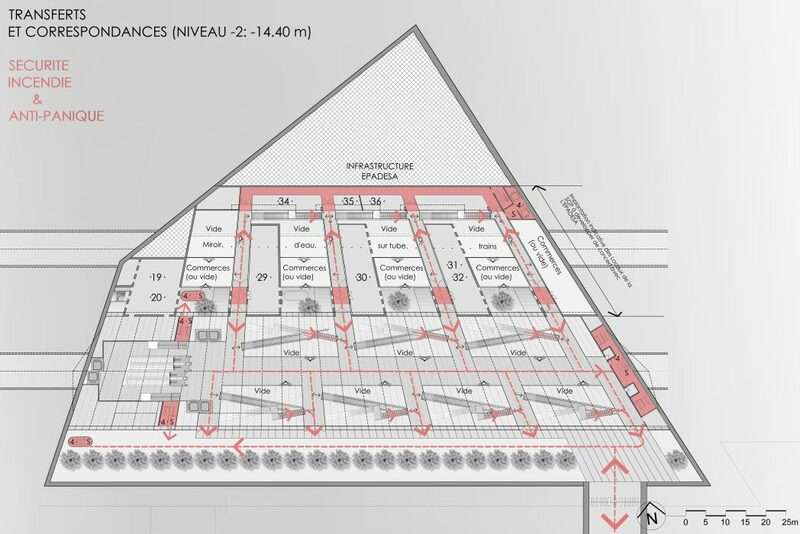 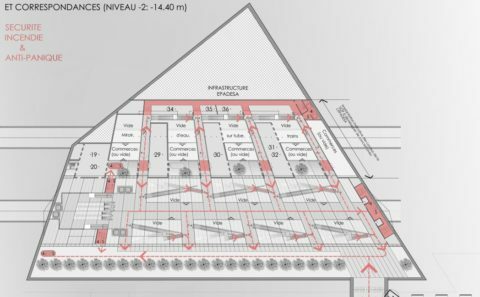 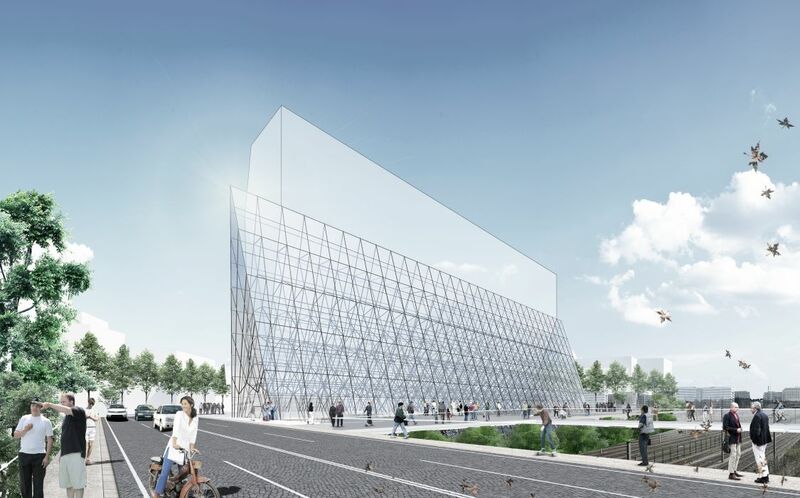 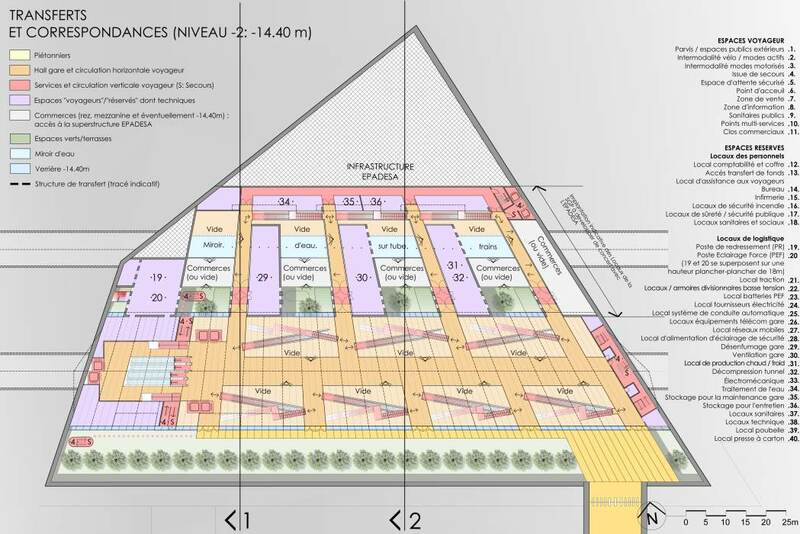 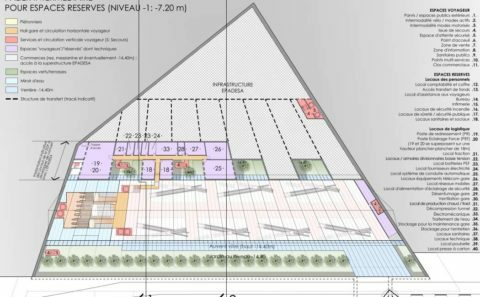 The station development is associated with a related project managed by EPADESA (the “Les Groues” complex) consisting of a superstructure of living accommodation and offices. 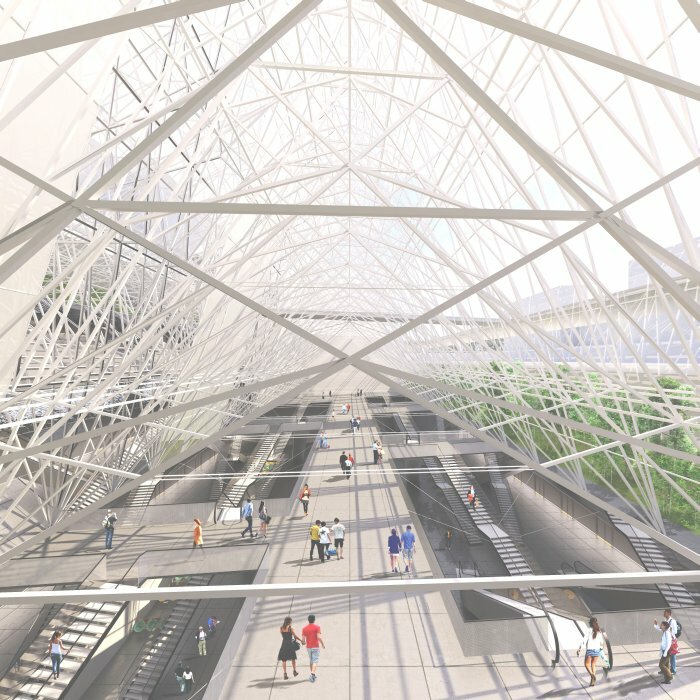 To ensure the success of the emblematic station project, and to secure its influence in the local area, it would, in absolute terms, be preferable to consider the various elements as part of a single design. 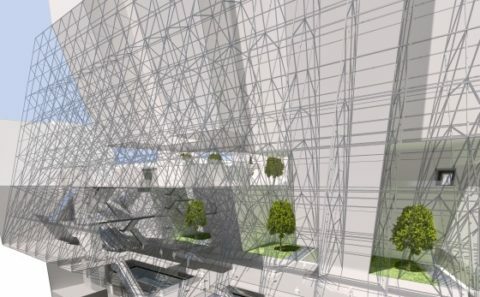 The existence of multiple clients has led to the splitting of the project into two design processes, with no more than simple coordination between the two. 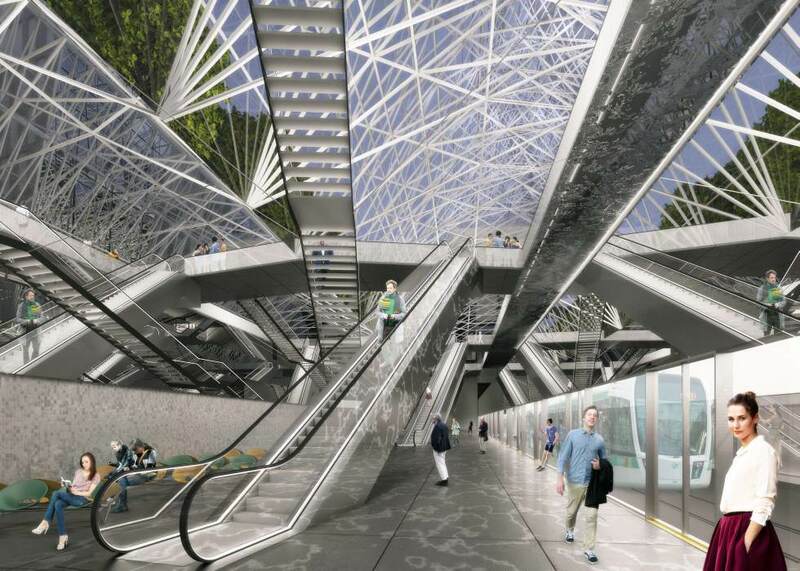 Although the issues are not insurmountable, this situation is problematic in the context of creating an emblematic station. 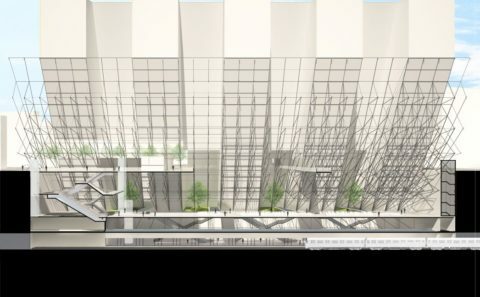 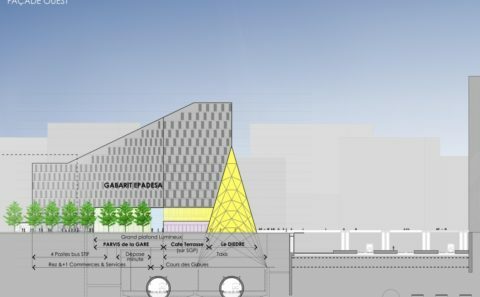 It is difficult to imagine that the station will have an impact on the local area if its visibility rises no higher than the ground floor level of a fairly tall building, which will, moreover, be designed by other parties. 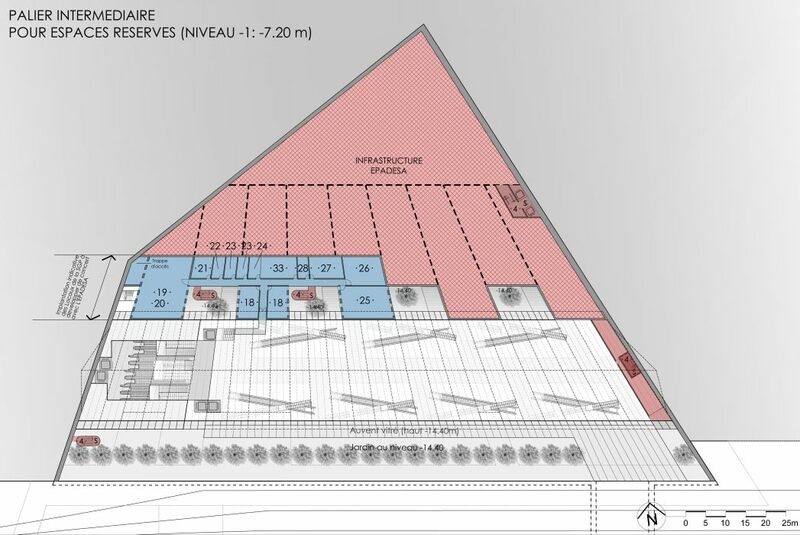 The optimal design of an “augmented station” requires consideration of the cross-section through the station and associated project as a whole, in order to find a better way for them to work together: allocating a more generous vertical elevation to the station and making the operational autonomy of the two projects simpler for the benefit of their respective clients. 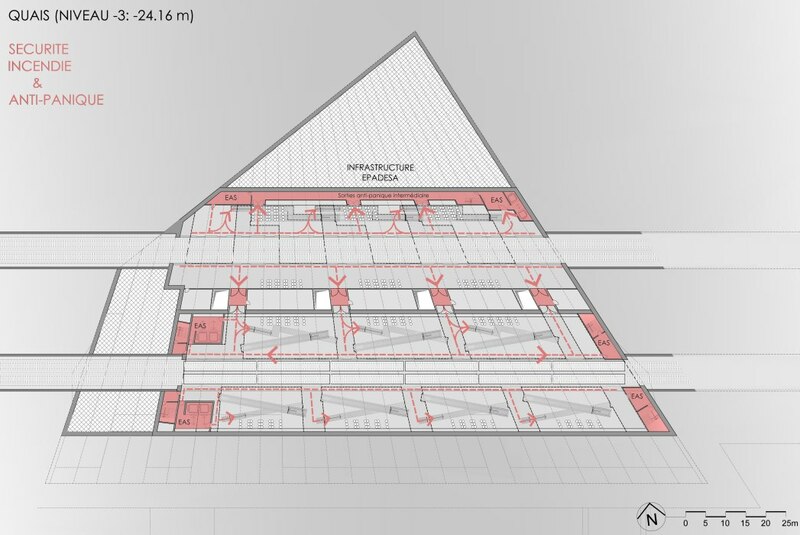 The preliminary studies commissioned by the clients have proposed superimposing the various floors of the superstructure required for the associated project on top of the ground floor occupied by the station; this would require massive columns to support these floors extending through the various station levels, which would obstruct the fluidity of movements and views. 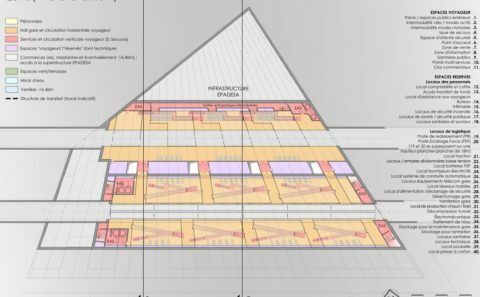 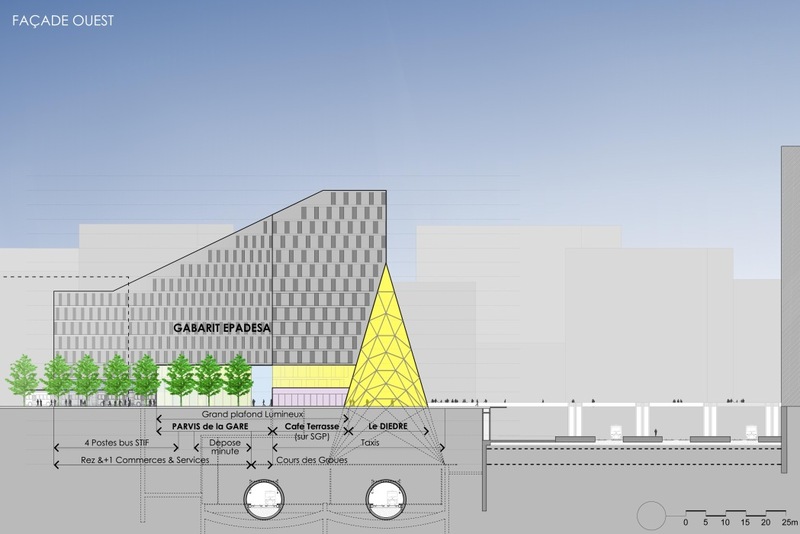 If this superimposed design was replaced by a progressive forward extension of the floors of the associated project above the station, then the station could open out upwards and there would not be any need for the station to support the load of the associated project: hence the idea of a volume whose transverse cross-section is a raised triangle, a dihedral. 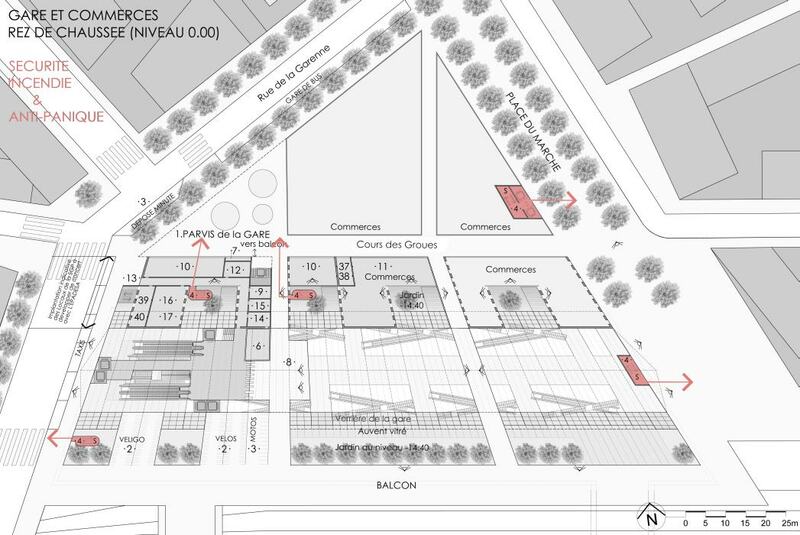 Its south-facing elevation is a large glazed façade to receive light and with views over the urban landscape of la Défense; on the north side it adjoins the associated project. 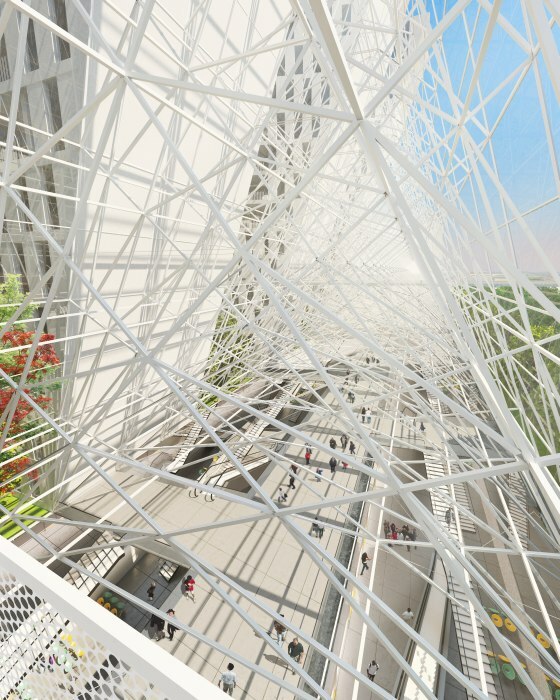 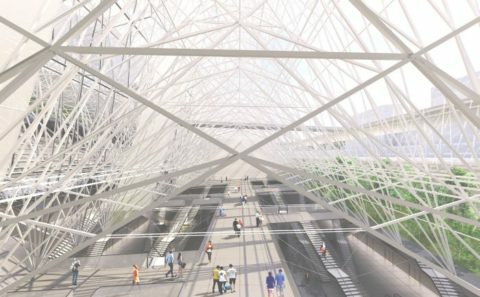 The station would become a large box of light, a magical lantern, a fine spiders web-like structure which would create plays of light when lit by daylight and night-time lighting. 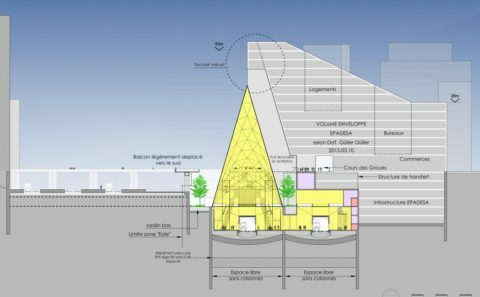 The eye is drawn to it by its vast triangular forecourt, 10 m high, which also forms the entrance porch for the associated project. 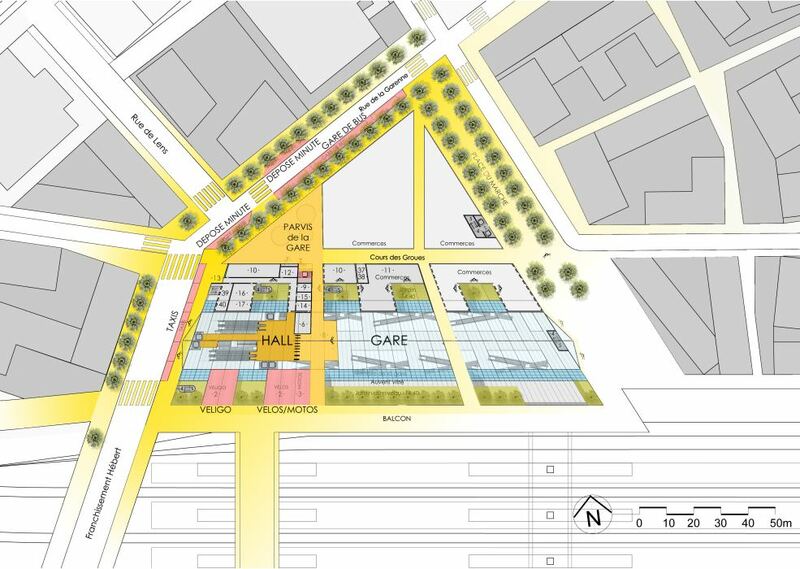 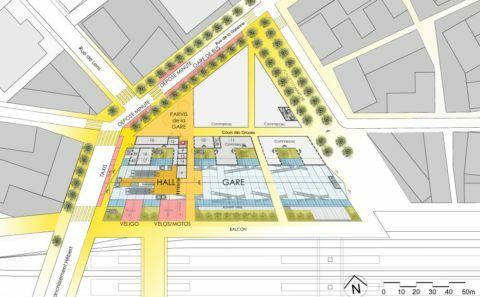 The “Les Groues” complex forms the centre of a neighbourhood in the making, below which there is a multimodal station connected to the Eole express train network. 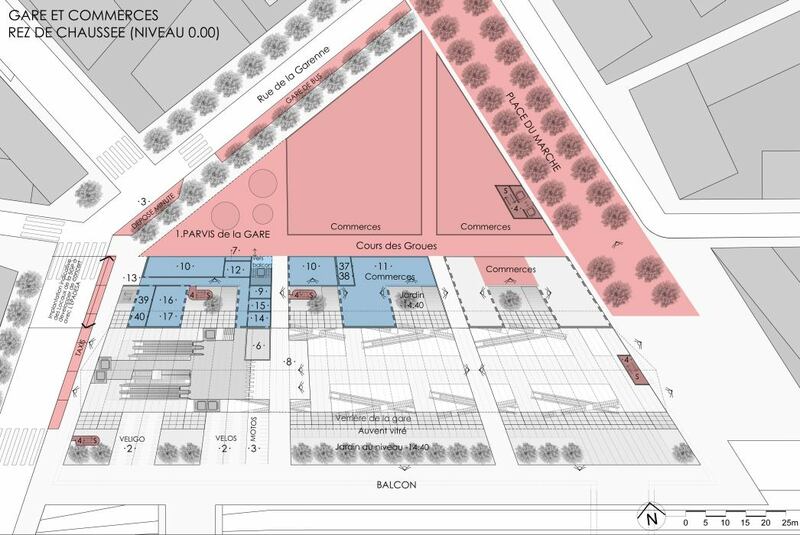 With an irregular polygonal ground plan, the complex sits inside a dense and equally irregular network of developed areas and pedestrianised public spaces, which also includes two walkways above the Eole tracks, the balcony and the place du Marché. 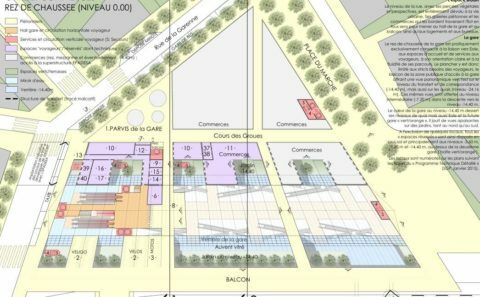 The ground floor of the complex must therefore offer a high degree of permeability and a varied commercial offering, boosted by the presence of the place du Marché on its eastern flank. 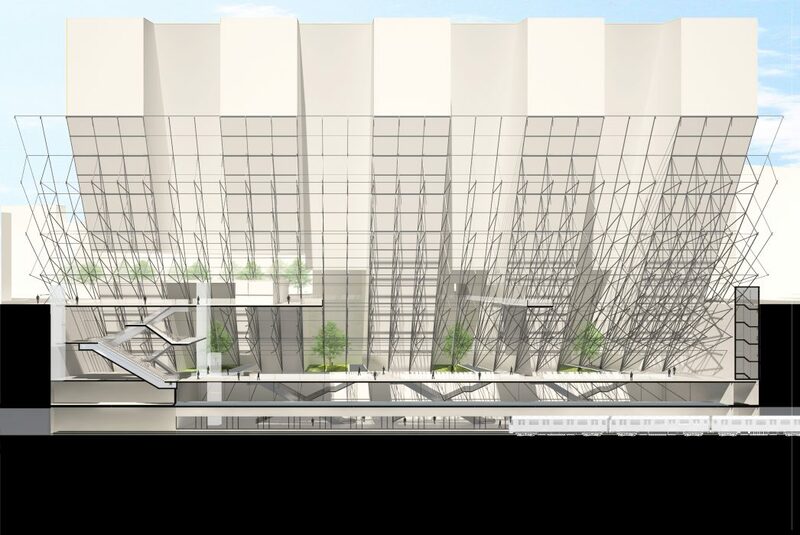 The transverse hall of the station can be accessed via the north forecourt and the south balcony, which emphasises this permeability. 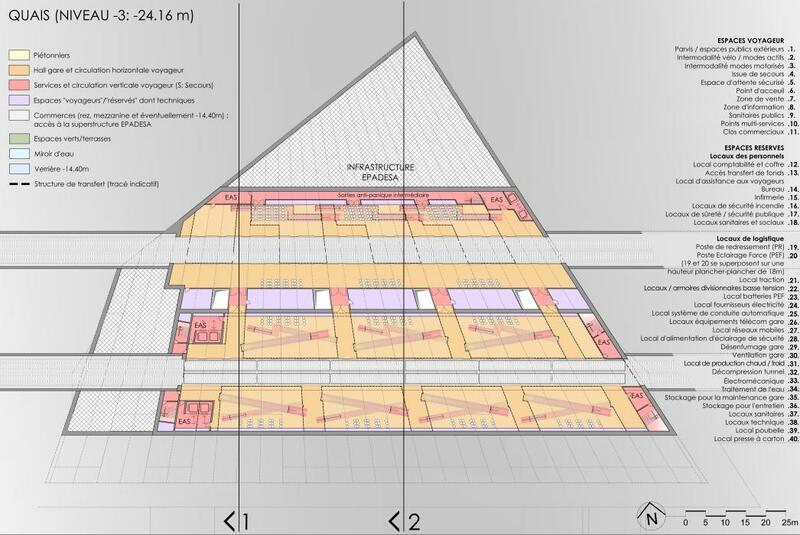 A long glazed dihedral covers the station over the entire southern length of the complex, and is built up against the large monolithic and porous volume of the associated project. 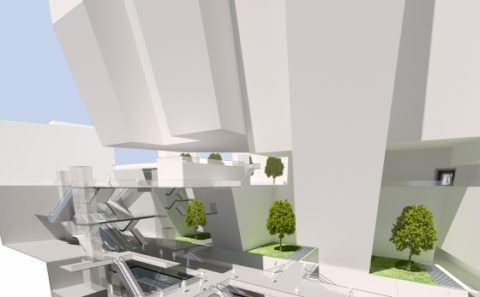 The dihedral has four openings for light and fresh air on its north-facing elevation, which are highly beneficial for the management of the station, both from a sensorial point of view and in terms of energy management. 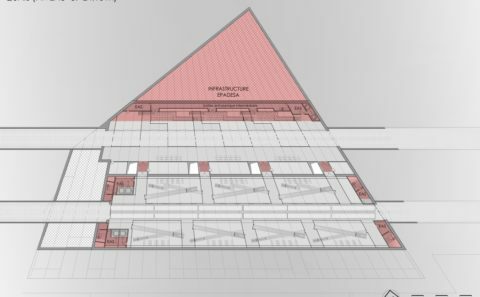 On the floors of the superstructure above the vast commercial ground floor, a collection of thin buildings, more or less perpendicular to the tracks, has been suggested with east-west oriented facades. 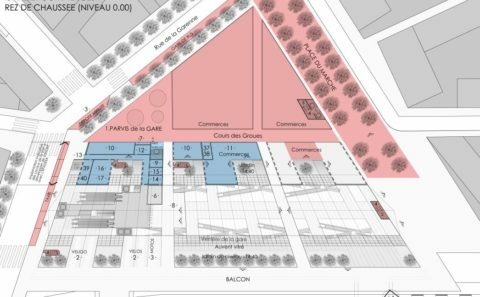 This arrangement avoids the “unrewarding” views over the cluster of Eole railway tracks and opens up the complex to the rue de la Garenne, and lighting up the public spaces to the north. 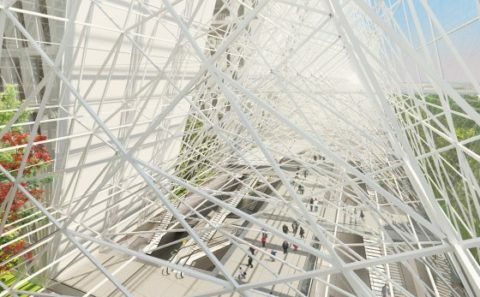 It also highlights the simplicity and economy of the structural features. 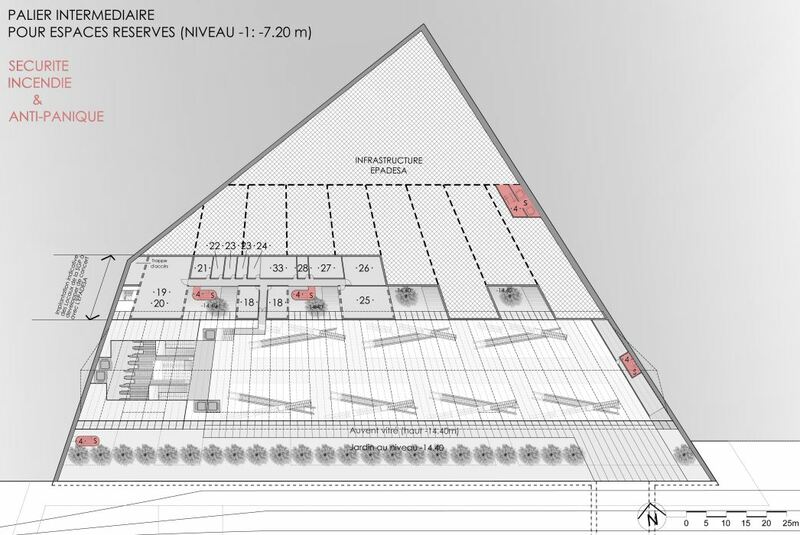 However, this main architectural idea of a dihedral concept gives the EPADESA total autonomy over its development project. 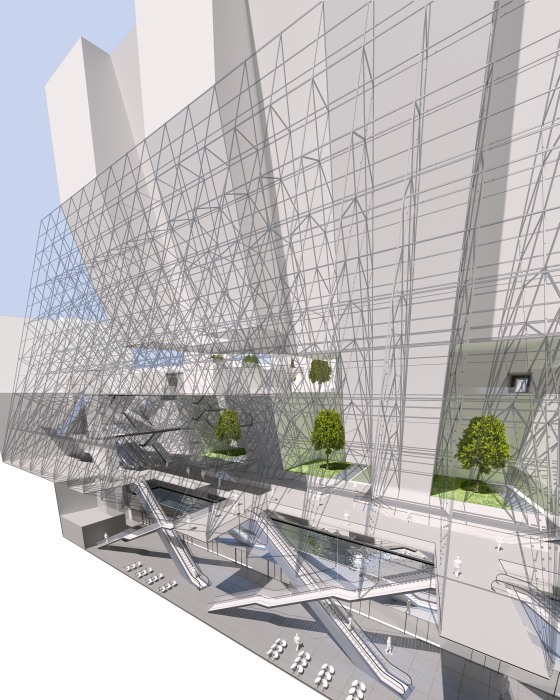 The station’s large transverse hall is located to the west of the dihedral and shares the same axis. 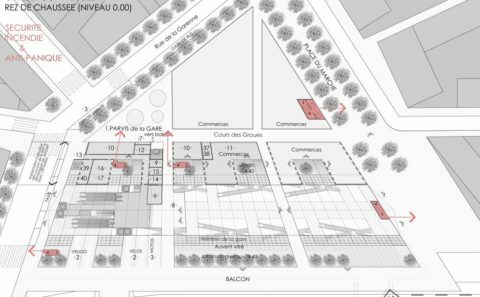 To the north, it can be accessed directly via the forecourt, through the opening visible from rue de Lens and from the Cours des Groues, at the corner of rue de la Garenne and the Hébert passageway. 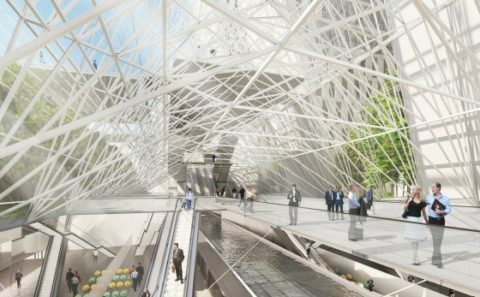 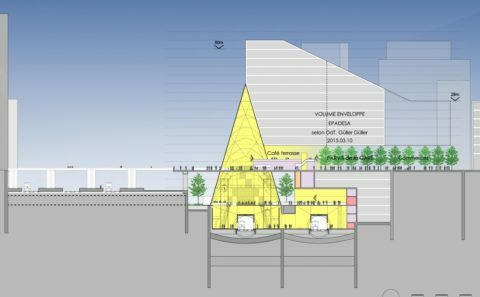 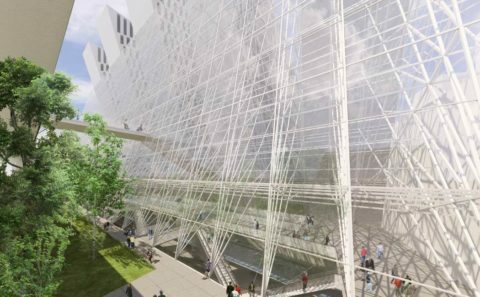 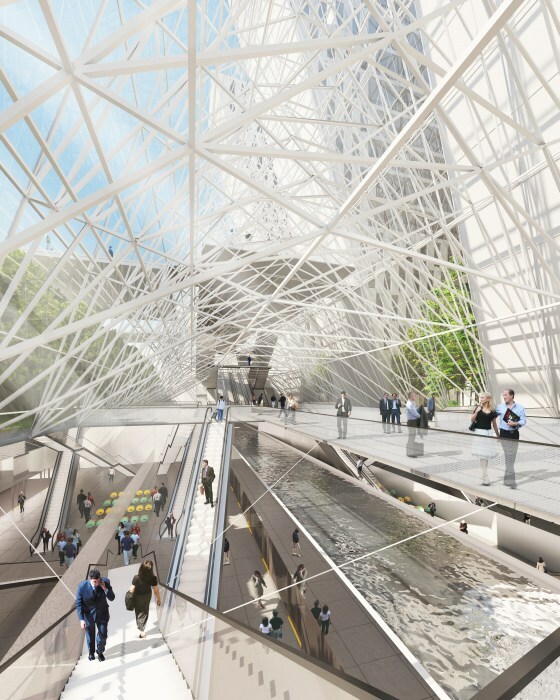 Covered by the associated project, the triangular space, three-floors high, of the forecourt extends as a balcony to the south via a bar with terrace area, above “multi-service outlets” and other “passenger service areas”, and also offering a view over the heart of the station. There is also direct access to the Hall from the south via the balcony and the “Eole” walkway. 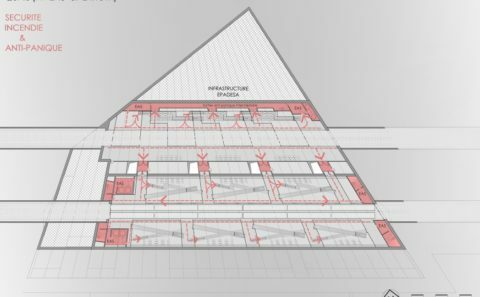 It is from this large hall, after passing the ticket barriers, that you can access the other floors (escalators, stairs and lifts), concentrated at the extreme western point in the axis of the dihedral and leading to the passenger transfer level (-14.40 m). 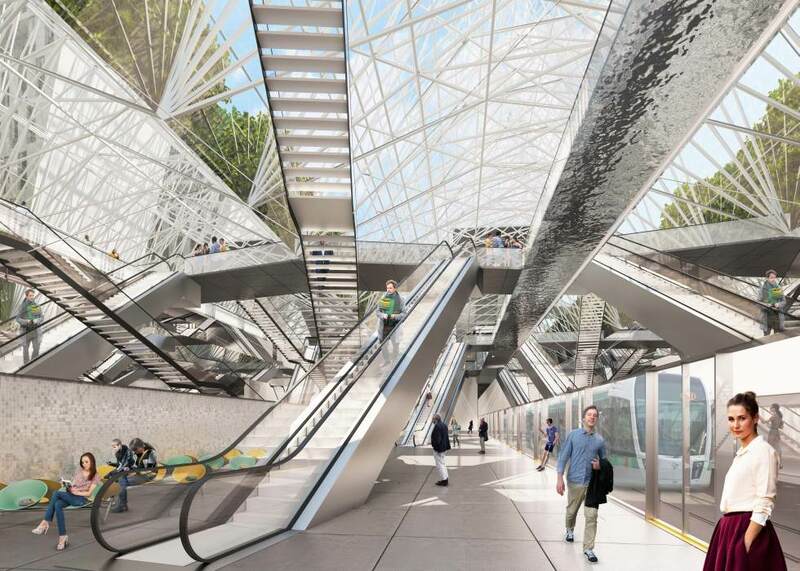 This concentration offers not only an unobstructed walkway, bathed in natural light, but also, both from the hall (0.00 m) and from the intermediate level (-7.20 m), wide views over the entire station through to the platforms at level -24.16 m.
The passenger transfer level (-14.40 m), which will provide connections in the future to the Verte-Orange station and to the Eole network, is also bathed in natural daylight and offers wide views towards the platforms at level -24.16 m; the south garden (at level -14.4 m, which extends under a walkway covered by a canopy; and the four small gardens to the north, at the foot of a light well which also provides natural ventilation. 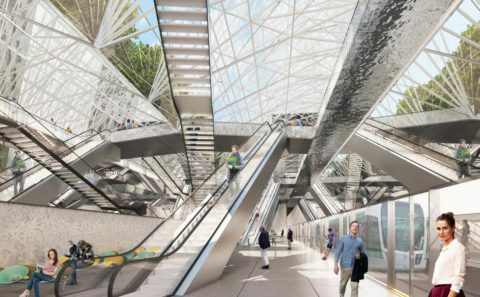 Stairs and escalators are arranged casually here in the vast openings, taking passengers gently down onto the platforms. 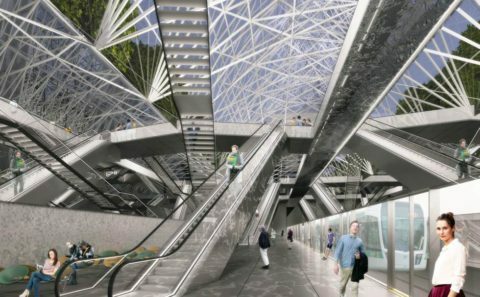 Once again there is a feeling of space and well-being, of “freshness”, which prevails on these large platforms, free of any columns, bathed in light and naturally ventilated at level -24.16 m.
The train “tube” is constructed here with its ceiling 5.4 m above the platforms, and creating an open volume about 3.7 m high between the “water mirror” which covers it and the under-surface (acoustically-perforated mirrored steel) of the floor at level -14.4 m.
The façades of the platforms are thus 5.9 m high, 2.5 m of which is for the glazed walls and access doors to the trains and 3.4 m for the fanlight which runs over it in a continuous length. 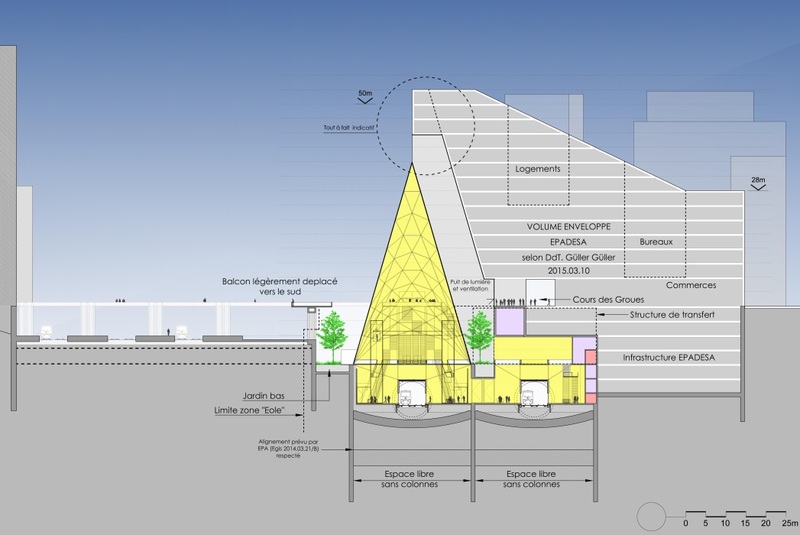 The images of the project show this fanlight in a mirror, once again to reflect the natural light. 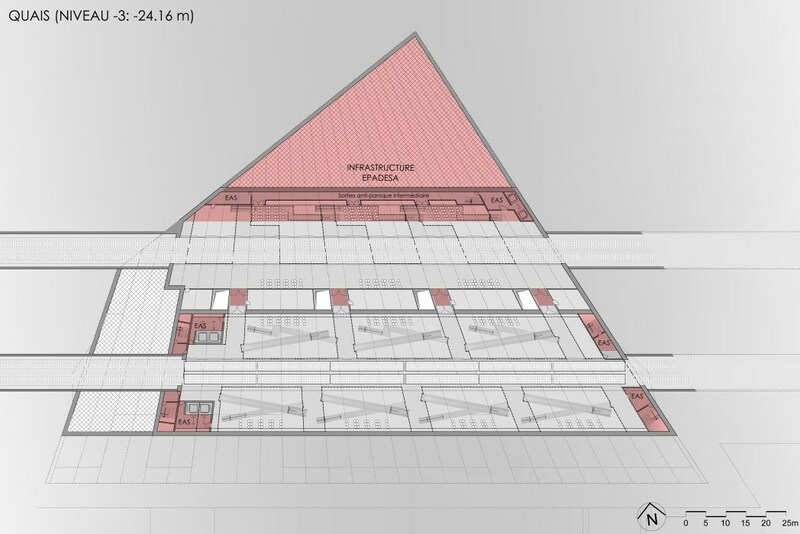 They illustrate the proposal to “expand” the space as much as possible. 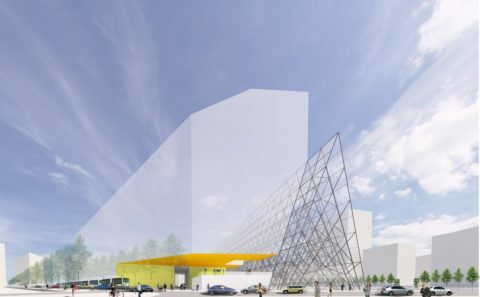 – ROBRECHTS & THIENPONT cvba (Turnhout), for the competence in Security.